I see from last week's book giveaway I am not the only fan of Sarah Thompson! Many of you love her flowing wire work style and her fabulous designs. Reader Lori Mahan is right : "I have dabbled in wire work, but I was doing it all on my own and could have used some guidance. This book would help me weave my way to learning how to do it." You will be learning from a great wire artist! Joanne Kropt was even more excited about this book when she said, "Wow! I have just begun making my own jewelry and it's ALL I can think about. I'm literally waiting for my first delivery of wire to arrive today! The stones should be here too! These pieces are stunning! I hope to be able to design/craft like that!" So who won? I numbered all the eligible entries and got the random number generator over on random.org to do the picking. The lucky winner is Paulette! Congratulations. Paulette, I do not have your contact info. Please email me at pearl@beadinggem.com before Monday to claim your prize. Otherwise I will redraw. Didn't win? You can purchase Woven in Wire here. 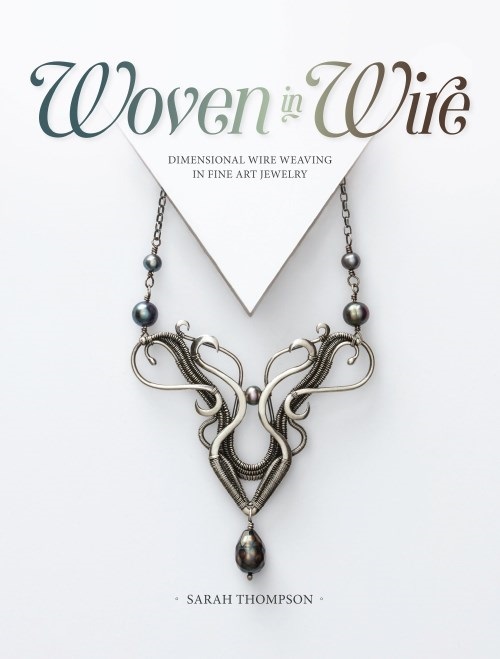 Also recommended is Sarah's first book, Fine Wire Weaving, - see my review. Her Craftsy class is well worth taking too.